Google has again been accused of invading privacy after secretly collecting details of millions of home wi-fi connections to help it sell adverts. The search engine giant mapped every wireless internet connection in the country and now uses the data to make money. 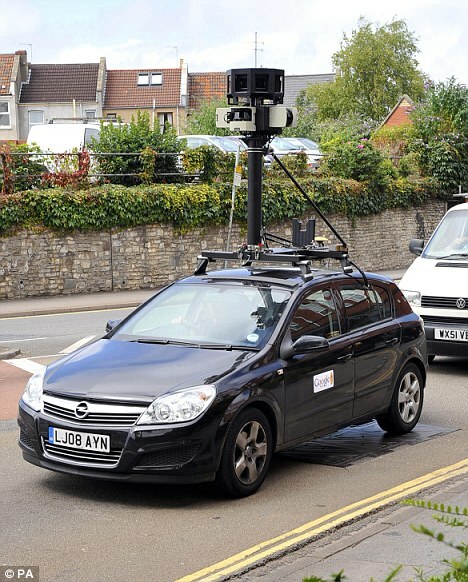 Google staff in specially adapted cars collected the signals from inside residents' homes as they toured the country for the company's Street View project. They were able to record the location of every router and wireless network without telling anyone because wi-fi signals spill out from inside homes on to the street. The company, which made a profit of £4.5billion last year, detected these signals with an antennae inside their vehicles and noted their location. The information now lets Google send mobile phone users adverts for nearby restaurants, shops and other services through its Google Maps application. For example, if someone is walking down the street carrying a mobile phone, software inside the phone can pinpoint the user's location by detecting nearby wi-fi networks and triangulating the position using Google's records. Links to nearby restaurants, shops and other services will then appear on the phone. Google makes money when customers click through to the local business websites. The use of residents' wi-fi networks is cheaper than locating a position via satellite. Details of Google's previously undisclosed data collection emerged after regulators in Germany demanded additional information from the search engine. The company has admitted it should have been more 'transparent' but played down the significance of the wi-fi mapping. So now they can track anyone mobile phone location without any authorisation from our state, ever been asked for your phone number at a google sign up or google shopping checkout? And how can you accidental collect information from unprotected networks, you'd have to be actively receiving it. The bit about them providing you adverts specifc to your location already exisits I think. - 3G phones with "new improved" always on broadband internet (to hell with the bees), anyway is it actually "off" when its off now? - If GPS does all the same why have they gone to the trouble of covertly "specially adapting" all their camera cars and the programming involved at what must be a significant cost? I don't like it. Do they work for Goldman or something? I beleive they only need to dial the number and the phone will react. access to the cells would tell you which cell you are in. phones these days even give the location of a photo you took within a few hundred yards. Yep, smells of BS alright " The use of residents' wi-fi networks is cheaper than locating a position via satellite." How can that be? If you have a GPS enabled phone you don't get charged to recieve a signal from the satellites. To use private WiFi signals you'd have to have a WiFi enabled phone and have WiFi turned on. I think the worry was that not only did they track where and which WiFi networks are out there they also snooped some of the traffic on those networks, supposedly due to a rogue engineer having put some malicious code in their software which was not spotted. What it would allow them to do would be to far more accurately target you with ads by local businesses, I have noticed how much more accurate these have become recently. wouldn't this only need the list of geographical IP addresses though? Yes, I believe that is what they are arguing and they are saying it was not their intention to snoop. That's pretty standard in GPS. Or, more specifically, Assisted GPS: the use of separate, approximate location data to bootstrap GPS. GPS alone takes a long time to get an initial fix on your position, and may be completely unable if your signal is obscured (e.g. indoors). My 'phone's satnav shows a big difference according to whether I enable or disable assisted mode. Yes, they've been open about that for a long time. Install Google maps on a phone, and it gives you the option to enable or disable this feature.